Ohio Northern’s stretches Chad Rex stretches for a first down while being tackled by Wilmington’s Zach Zurface during Saturday’s game at Dial Robinson Stadium in Ada. 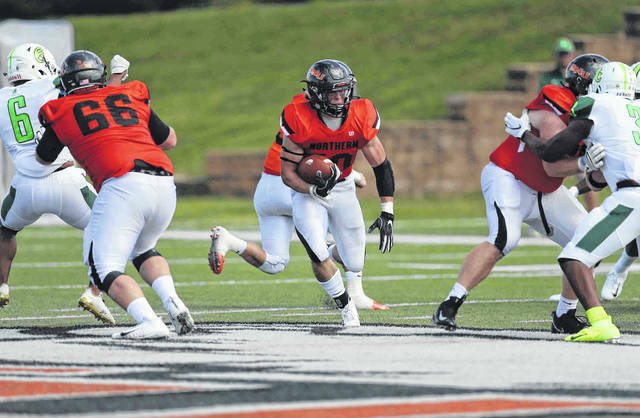 Ohio Northern’s Kyle Gonterman (66) and Sam Shook (right) provide running room for Brock Martin during Saturday’s game against Wilmington at Dial Robinson Stadium in Ada. Ohio Northern’s Anthony McFadden looks for running room against Wilmington’s Kyle Ackley during Saturday’s game against Wilmington at Dial Robinson Stadium in Ada. 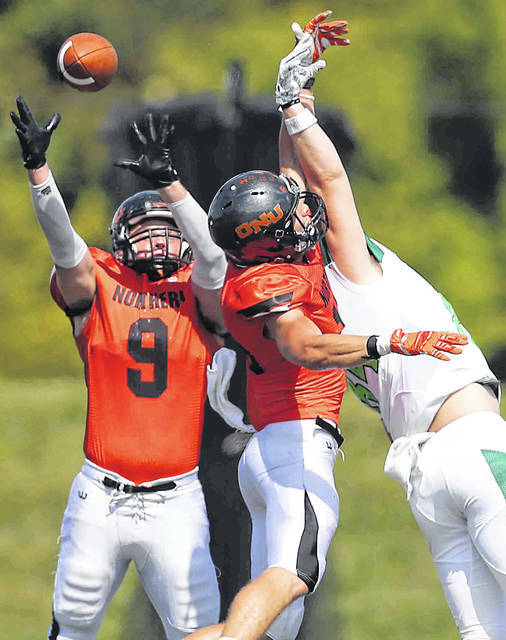 Ohio Northern’s Andrew Valenti and Luke Perkins defend on a pass intended for Wilmington’s Ace Taylor during Saturday’s game at Dial Robinson Stadium in Ada. 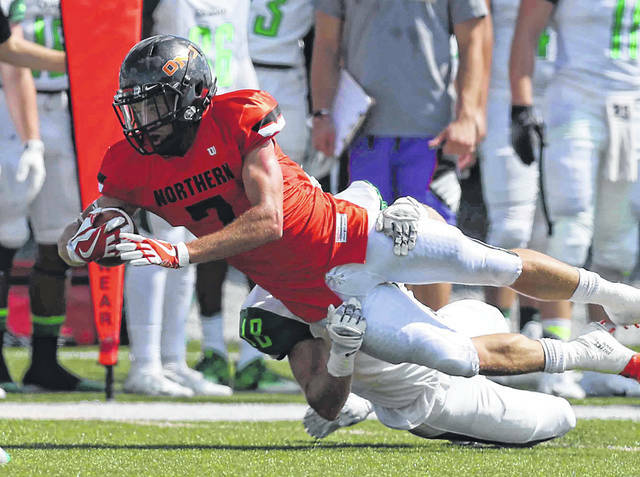 ADA — Ohio Northern University amassed 610 yards of total offense on a warm Saturday afternoon at Dial-Roberson Stadium in Ada. Wilmington College was the recipient of that explosion in a 49-16 rout in an Ohio Athletic Conference battle. That yardage total also included 357 yards rushing on 45 carries, with a pair of running backs going over 100 yards each: A. J. Marks (10 carries, 146 yards) and Brock Martin (23 rushes, 136 yards). The Polar Bears (3-0, 2-0 OAC) got it going early – on the third possession of the game – with a 12-play, 65-yard drive that ate up 6:40 of the first-period clock. The capper came as Martin bulled in over left guard at 4:14 of the first period. Chase Watson added the extra point for a 7-0 lead. The Quakers (1-1, 0-1 OAC) replied with a 7-play, 75-yard series, tying it via a 45-yard screen pass on the right sideline from Kyle Barrett to DJ Chambers at 1:31 of the opening quarter. Tyler Butcher’s point-after touchdown tied it at 7-7. 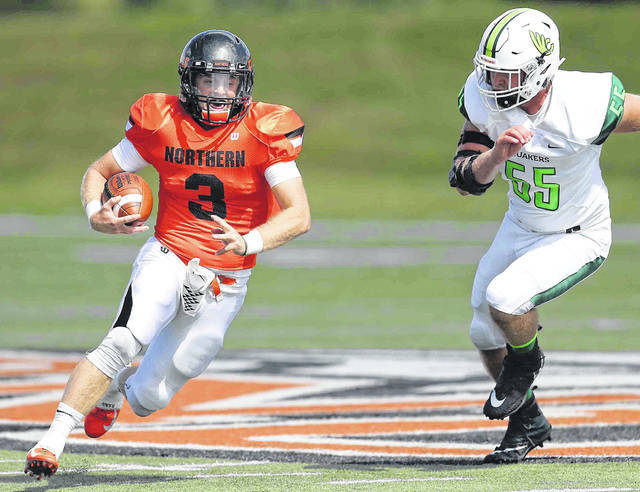 Ohio Northern went up for good midway through the second period courtesy of a 2-yard run over left guard by Martin, finishing off an 11-play, 80-yard scoring series. Watson’s conversion put the Polar Bears up 14-7 at 7:16 of the second period. With time running down in the first half, ONU ended a 10-play, 93-yard series with a 17-yard pass from Anthony McFadden to Chase Rose with 35 seconds to go in the half and Watson tacked on the extra point for a 21-7 halftime score. ONU’s next scoring drive was very quick in the third period: two plays, 87 yards. The score came as Marks took off from the 37, went up the middle, spun out of a would-be tackler at midfield and was gone to pay dirt. Watson extended the Polar Bear lead to 28-7 with 12:19 to go in the third period. Wilmington replied with a seven-play, 55-yard drive that ended up on a Butcher 37-yard field goal at 10:16 of the third period to make the scoreboard read 28-10, ONU. After an interception of Barrett by Greg Dennis at the goal line, ONU followed with another quick scoring drive: four plays, 77 yards. This time, McFadden dropped to throw, pump-faked to the left side and found Caleb Saalfeld wide open down the left side for the six. Watson made it 35-10, Polar Bears, with 8:12 remaining in the third period. To open the fourth period, ONU increased its lead to 42-10 with a 6-play, 84-yard scoring series. This time, Chad Rex got behind the secondary and hauled in a 3-yard scoring pass from McFadden at 11:53 of the fourth period, with Watson’s extra point putting the Polar Bears up by 32. The Polar Bear defense got into the scoring act with 7:13 left when David Haseleu picked off Barrett on the right side and returned it 37 yards down the sideline to the tally. Watson made it 49-10. Wilmington closed scoring courtesy of a 13-play, 75-yard sequence. Barrett found Zayne Hart from 5 yards out and Butcher’s conversion failed.